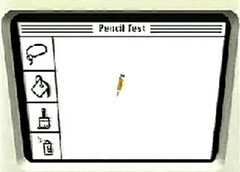 “Pencil Test” was entirely created on a Mac II (some say actually a Mac IIx, but the dates don’t match), by a group of talented artists (more on this later) working with Apple’s Advanced Technology Graphics Group. The main software used was called Super3D, from Silicon Beach Software (then Aldus) and the 3D models were animated using MacTwixt, a Mac version of the public-domain animation package Twixt. The digital movie was output to an imagesetter frame by frame, with each frame taking an average of 30 minutes to render. For this task, a distributed rendering program worked in parallel in a period of four days of elapsed time, on a network of 25 Mac II computers over an EtherTalk network. The finished frames occupied 1.4 gigabytes of a 2.5-gigabyte SCSI disk drive. They were then decompressed and transferred to an Abekas A60 digital sequence store and finally put on film to a Sony D-1 digital component video recorder. The soundtrack for the video was created using (of course) Macs with Digital Performer, connected to music synthesizers through the Apple MIDI interface. These and other technical tidbits are still available in not one but two juicy Apple knowledge base entries. There’s also a “Behind the scenes” movie, which I’m embedding here. But Pencil Test wasn’t only a hardware and software labor. Behind the short were some young creatives which in the Nineties would propel digital animation forward. In the ending titles you can spot names such as Larry Lasseter, Andrew Stanton and Galyn Susman from Pixar, which later distinguished themselves with CGI gems such as Toy Story, Finding Nemo, Ratatouille and Wall-E, itself a love letter towards Apple products.